Glory to God, Lent is underway! For many of us, the challenges of Clean Week have been very practical: targeting distractions and cares that compete with Lent, prioritizing attendance at services, cleaning out the refrigerator and refreshing our fasting-food shopping lists while squeezing in a few power naps to balance Lent’s natural draw on our energy. Clean Week is a sprint wherein we break free from the congestion of daily life and then set a bit slower yet calculated pace—one that can be maintained until the final push of Holy Week. For many of us, also, the lenten demons got an early start this year. Illness, car trouble, family crisis, or some good old-fashioned irritation. Our spiritual tradition is clear that whenever a Christian sets a spiritual goal, embraces personal asceticism, or just sits down to make a spiritual plan, the temptation to irritability confronts us almost immediately—perhaps because we’re that easily wearied, perhaps because we so quickly feel proud of ourselves. 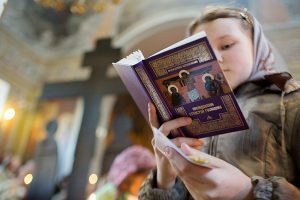 After the exercise of Clean Week, the wisdom of the Church grants us a rest in the joy of Triumph of Orthodoxy Sunday. In the eighth century, a persecution arose against the holy icons and those who venerated them. Churches were desecrated, and the faithful were tortured and martyred. 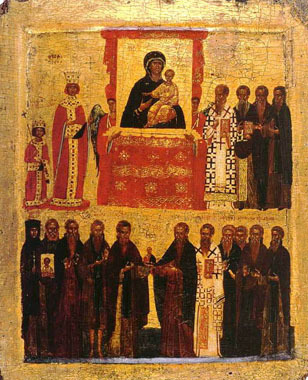 In the year 842, the empress Theodora put an end to the persecution and established the first Sunday of Great Lent as a day of thanksgiving to God for the restoration of the veneration of icons. 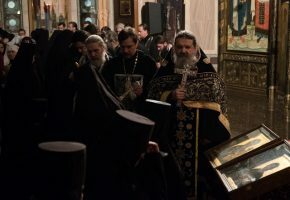 Our joy arises both from triumph over heresy and from the realization that we have been granted the gift of membership in Orthodoxy. May the joyful cleansing and spiritual reality of Lent be a blessing on us all this year, as it is every year. Disregarding every apparent challenge, practical or spiritual, may we enter into the prescribed lifestyle of Lent to the best of ourability, in community and counsel, without comparing or despairing, and may our hearts (most importantly!) be inclined towards God, in all places and with all people, that every aspect of our life be sanctified in a manner that propels us into the light of the Resurrection.